English Version: David Matranga, Adam Gibbs, Emily Neves, Jessica Boone, Rob Mungle, Mike Yager, Rebekah Stevens. Growing up I was obsessed with what I called then, Japanese Animation, now in today’s term it’s just Anime. Many cultures create this dynamic way of storytelling. Harlock is a prime example of an action packed adrenaline ride of pure science fiction adventure. 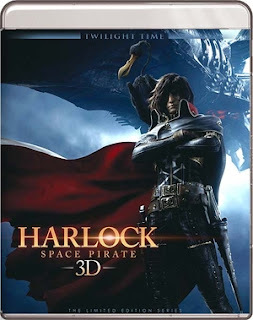 This 2013 Japanese animation film is based on the popular character in the Japanese manga series Space Pirate Captain Harlock which ran originally for 5 volumes in 1977 to 1979. Now what I remember the most is watching the 1978 animated series by Toei Animation. This movie I am reviewing is a computer animated film, not typical animation or cartoon format, the computer animated reality has taken over a lot of animation lately. I personal am not a fan of computer animation, I think it looks bad in many ways but with that said this version I am reviewing which is being brought out wonderfully by Twilight Time Blu-ray is actually one that I found very enjoyable and very well made. The 3D animation and even the 2D animation is spectacularly created and stands out. I would have loved to seen an original animation version, in the old way of Anime, but am satisfied for the most part with this version. The original animated series ran for 42 episodes telling a grand science fiction story. The plot is what you would expect from a futuristic science fiction tale. Mankind has the ability to travel faster than the speed of light and has built many places throughout the planets in the universe. Soon all the resources in the universe is fading away and the people must return home back to earth, but soon the factions battle it out for earth. There is a great war and soon a law is created that Earth cannot be populated because it is a holy sacred planet. So a government is created. A group of Fleet known as the Gaia Fleet. Their goal is to defend earth. Harlock defends earth with his Deathshadow Martyr Fleet. This technology was given to Harlock because of his great deed in saving an alien race known as Nibelung. Because of this deed they gave him the technology of powerful ships that helped defend earth. So to make a long story short, the earth was protected, but a treaty was put into place that peace would happen but the main elite persons are allowed to live on Earth, breaking the basic rule. Plus, only persons that where elite are allowed. Harlock did not take to this idea. He went about protecting earth by fighting and destroying the other ships. He released the dark matter upon the earth in hopes to protect it, but what happened instead is it destroyed all life on earth. Of the 4 ships, the only ship, Harlock’s Arcadia survived, but in the process it changed him, turning him immortal. You then flash 100 years in the future. Now Harlock is sought out, he and his rogues must battle the controlling government who lies to the people and changes truth to what they see fit. Now what makes this Twilight Time blu-ray awesome is it’s a 2-disc special edition. You get the original Japanese version and also the international version. I prefer the original Japanese version. Always watch a movie in its original setting if possible. Disc 2 is both 2D and 3D versions. This is a spectacular blu-ray that Twilight Time has given great effort to and brought out lovingly for the lover of cinema, anime and most of all the adventurous reality of childhood make believe through science fiction. There are actually voice talents of some legends in the original Japanese version. The voiced character of Roujin is voiced by Kiyoshi Kobayashi. Kiyoshi is a truly gifted voice performer that has done some of the greats in cinema both great and small. He is the voice of the long running character Daisuke Jigen in the long running animated series Lupin the 3rd, from 1969 to 2016. Also what is really funny and interesting about his persona is he would dub the Japanese language in America films for the Japanese audience. He became the Japanese voices of James Coburn in over 20 films, from The Magnificent Seven to In Like Flint to The Nutty Professor. He voiced Lee Marvin, Tommy Lee Jones Franco Nero, Sam Elliott, Jack Palance, Clint Eastwood, and many upon many others. Not only a master talent of voice in animation but in dubbing also. This is a wonderful computer animated feature that brings out all the wonders of anime, manga, adventure, action, science fiction, twisted around a spectacular futuristic story that any child, or adult with imagination will fall in love with. It’s not for everyone, but for those who get, and understand anime and science fiction, I feel this is must experience. A lovely blu-ray as always put out wonderfully by Twilight Time. They gave a great product with both versions and also both versions in 2D and 3D. Flawless. That’s really all I should need to say. There is no flaw in this reality. A wonderful vibrant transfer of colors and crisp imagery that transcends off the screen. The sound quality is fantastic and creates a total perfection in sound. I think this is one of the strongest examples of how to treat a film on a high quality transfer and sound. I think this is one of the best Twilight Time Blu-ray Special Features department. It comes with a vast array of excellent programs and features that make the product all the more desirable. Isolated Score Track (Original Japanese Version). The music is done by a wonderful person, Tetsuya Takahashi, who has worked in the Video Game world for many years and also does film music for mainly animated features. Most gamers know him because he is the head of the software company Monolith Soft Inc. He has composed music for Appleseed series of movies. Resident Evil Degeneration, Starship Troopers Invasion and many others. His talent is amazing and it is something that stands out and you can’t not listen to the music he composes. Interviews with Harlock Creator Leiji Matsumoto with a running time of about 14 minutes, Director Shinji Aramaki with a running time of a little over 4 minutes, and Adaptation/Screenwriter Harutoshi Fukui with a running time of a little over 3 minutes. The Making of Harlock: Space Pirate has a running time of a little over 26 minutes. This is a wonderful look at the reality of Harlock over the years and the franchise. Venice Film Festival World Premiere Highlights. A Press conference running a little over 4 minutes. Red Carpet a running of a little over 4 minutes. Standing Ovation with a running time of a little over 4 minutes. 5 TV Spots and one Teaser. Also the all-important insert booklet containing an essay on the film from the amazing wonderful film historian Julie Kirgo. Always a true treat to read and look at the images. A wonderful film note booklet like always. Another flawless product by Twilight Time. This is true gem to own. It’s a must see experience that I highly recommend as being something truly magical in the animation department of film making. The product by Twilight Time makes it all the more fantastic in audio and video and a wonderful array of special features.